Judge Sol Gothard, JD, MSW, ACSW, was elected to the Fifth Circuit Court of Appeal for the State of Louisiana in 1986 where he served as Senior Judge, until his retirement in 2005. He was formerly Chief Judge of the Juvenile Court, Parish of Jefferson, State of Louisiana, having served there for fourteen years. Before being elected Judge in 1972, he was engaged in the private practice of law for over ten years. Prior to that, he was a social worker for sixteen years in a variety of settings. He has a Masters degree in social work from Case Western Reserve University, and a JD from Loyola University in New Orleans. He is an Honorably Discharged Veteran of the United States Army. He is Past President of the Louisiana Council of Juvenile Court Judges. He teaches at Tulane University Graduate School of Social Work, where he has the rank of full professor. 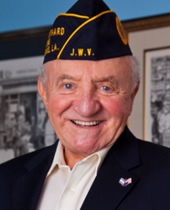 He is currently Commander of the New Orleans Post of the Jewish War Veterans of America (JWV). In the past, Judge Gothard was selected “Citizen of the Year” by the Louisiana State Chapter of the National Association of Social Workers; he was awarded the Alfred E. Clay award for significant contributions to children by the Children’s Bureau of Greater New Orleans; he delivered the commencement address to the graduates of the Tulane University Graduate School of Social Work, and the commencement address to the graduates of Mandel School of Applied Social Sciences of Case Western Reserve University, where he was also honored as “Alumnus of the Year”. He delivered the keynote address at the closing plenary of the 1990 NASW annual conference in Boston, which was attended by approximately 5,000 social workers. 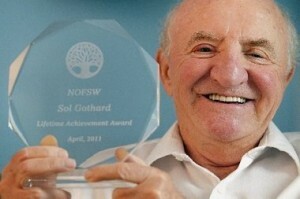 He was the first recipient of the “Sol Gothard Lifetime Achievement Award” established by the National Organization of Forensic Social Work. In 2013, he was honored as a “People’s Health Champion” by Peoples Health Insurance, for his work in revitalizing a dying veterans organization which became the fastest growing JWV Post in America. Judge Gothard is a member or past member of the Board of Directors of numerous organizations, including The American Professional Society On The Abuse Of Children (APSAC), The American Humane Association, Children’s Division, The National Organization of Forensic Social Work (NOFSW), 2000: Year of the Humane Child, One Voice: The National Alliance for Abuse Awareness, Our Children Our Future Charitable Foundation, the Louisiana SPCA, the Louisiana Animal Welfare Commission, the Jewish Welfare Federation of Greater New Orleans. “One of the main problems in the Family Courts, with regard to custody, is that when a parent reports suspected abuse, as they are mandated by law to do, the courts, all too often, shift the paradigm by accusing the reporting parent of “parental alienation syndrome.” Although this has been thoroughly discredited, the same dynamics occur in the courts, and those using the concept simply drop the “syndrome” part. Thus, the focus shifts from the possible abuse of a child to the parent alleging abuse. 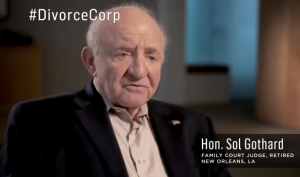 Click Here to Read Judge Sol Gothard’s Statement Regarding Divorce Corp.
Footage of Judge Gothard, courtesy of Dominique Lasseur’s Breaking the Silence.